This excerpted foreword by Howie Carr has been republished with permission from Chappaquiddick: Power, Privilege, and the Ted Kennedy Cover-up by the late Leo Damore (Regnery Publishing, 2018). If anyone ever truly deserved a Profiles in Courage Award, it was the late Leo Damore, the author of this book. Of course, the awards are handed out by the Kennedy family, and they are all about, not courage, but Political Correctness. But no one can dispute the fact that Damore put himself and his career on the line to write this book, and that one way or another, he paid the ultimate price—as a suicide, in 1995, at the age of 65. Senatorial Privilege: The Chappaquiddick Cover-Up was a New York Times best seller in 1988. It sold more than a million copies. Damore’s volume established a previously obscure publishing house, Regnery, as a major force in the book trade. Its success also disproved what New York publishers had long believed, or perhaps just hoped, that there was no real market out there for books that spoke, really spoke, truth to liberal power. If you are just now discovering Senatorial Privilege, you may not be aware of the controversy that surrounded its initial publication. Damore seemed a most unlikely person to blow the lid off the Chappaquiddick cover up. Born in Ontario, he was a reporter for the Cape Cod Times. His first book, in 1967, had been a standard post-JFK assassination hagiography, The Cape Cod Years of John Fitzgerald Kennedy. In the final scene of Cape Cod Years, JFK returns to Boston for the final time, in October 1963, for a major black-tie fundraiser with the Democrat governors of New England. As Damore told the story, after the dinner a Hyannis housepainter named Fred Caouette approached the president and was “brusquely challenged” by a Secret Service agent. That’s the way all Kennedy books were written back then, even by Leo Damore. Little did Damore or anyone else know that earlier that evening, the tuxedoed president had summoned Mimi Alford, the intern he had deflowered in the White House a year earlier at the age of 19, to his suite at the Sheraton Plaza, where he ordered her to fellate his younger brother Teddy. “You’ve got to be kidding, Mr. President,” she recalled herself replying in her 2012 memoir. Damore got a $150,000 advance from Random House, and he spent years digging up the truth. His most important source would be Joe Gargan, Teddy’s first cousin who rented the cottage that evening. Like Michael Skakel, the convicted murderer in the next generation, Gargan was a kinsman, but not really a Kennedy. And like Skakel, in his fury against his mistreatment by the family, Gargan would eventually spill the beans. If it came down to a fight with the Kennedys, Random House couldn’t win. In 1967, Jackie Kennedy had tried to stop publication of another, much more innocuous book, The Death of a President. In retrospect, Damore was lucky to have found any publisher willing to stand up to the wrath of the Kennedys. When it was finally published by Regnery, Senatorial Privilege was ignored by the critics, but Damore’s expose was so thorough and so damning that even with no publicity, it still skyrocketed to the top of the best-seller lists. But then, Chappaquiddick was a scandal for the ages, even by Kennedy standards. Mary Jo Kopechne, for instance—everything about her screamed Kennedy girlfriend. She wasn’t wearing underwear when she died, and she was drunk—her blood-alcohol level was .09. Her first boss in Washington was Sen. George Smathers of Florida, JFK’s best friend in Congress, who used to travel with the future president to Havana in those pre-Castro days, where they were treated to the finest prostitutes in Cuba, compliments of gangsters Meyer Lansky and Santo Trafficante Jr. In Washington, Kopechne’s landlord was Bobby Baker, the longtime bagman for, among others, Lyndon Johnson. Baker also ran a private DC “club” which offered the services of high-priced hookers, among them Ellen Rometsch, a suspected East German spy who was being investigated by a Senate committee for her relationship with JFK when she was suddenly deported in 1963. The Kennedys may not have been able to stop publication of Senatorial Privilege, but revenge, as they say, is a dish best served cold. And after those first few big royalty checks, nothing was ever the same for Damore. As his wife divorced him, he fell into a deep depression and began threatening suicide. At the same time, Damore also started research on a new book about Mary Pinchot Meyer, one of JFK’s last blue-blooded girlfriends. Meyer was the drop-dead gorgeous sister-in-law of Ben Bradlee, later of the Washington Post. Bradlee was so close to JFK that in 1962 he was given the assignment of using his magazine, Newsweek, to spike the scandalous true story of Kennedy’s first marriage, to a twice-divorced Protestant socialite in Palm Beach in 1947. Meyer was another fascinating subject—during her affair with JFK, she got into drugs, and had begun visiting LSD guru Dr. Timothy Leary just before the assassination. Less than a year after Dallas, she was mysteriously shot to death while jogging on a canal path in Georgetown. An obviously innocent young black man was arrested and charged, and then acquitted. The evening of her murder, Meyer’s brother-in-law Bradlee went to her house to retrieve her secret diary about the affair with JFK. Inside, in the dark, Bradlee discovered that another intruder had gotten there first—James Jesus Angleton, the legendary CIA spook, who had his own sneaky eyes-only reasons for wanting the diary of the late president’s paramour. I met Damore in 1994, on the 25th anniversary of Chappaquiddick. I was doing my radio show from the cottage on Chappaquiddick, and I booked some of the surviving principals. Only Damore asked for money—$100. Every time I spoke to him, he seemed nervous, agitated. The day after the show he telephoned again, begging me to send him the money ASAP, which I did. Fifteen months later, Damore was depressed and broke, about to be evicted from his rented house in Essex CT. As a visiting nurse and a constable (who was there to serve the eviction notice) looked on in horror, Damore pulled out a gun and shot himself in the head. 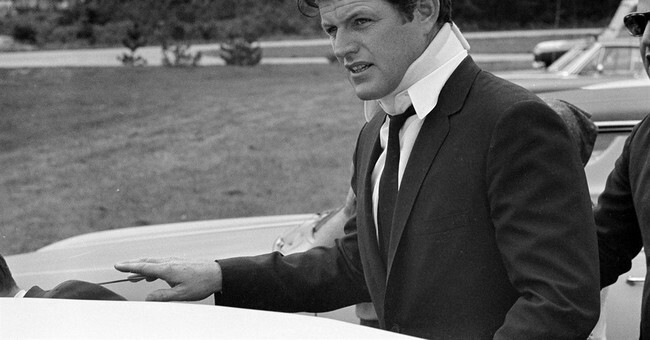 Ted Kennedy died of brain cancer in 2009, at the age of 77. In his later years, it was considered bad form to even mention Chappaquiddick in polite company. Teddy himself seemed oblivious to the scandal—he named his last dog Splash. In 2015, the Edward M. Kennedy Institute for the Senate opened in Dorchester. One of its exhibits is entitled “the Senate Immersion Module.” Immersion—you can’t make this stuff up. Somehow I don’t think Teddy was referring to Leo Damore. Few of the principals ever talked about what happened. The prosecutor, Walter Steele, was quickly appointed to a state judgeship—another nationwide search, as we say in Massachusetts. As a judge, his most famous case involved allowing a convicted child predator to leave the state without restrictions, after which the offender moved to Montana and then murdered and cannibalized a 7-year old boy. Do you think the Kopechnes would have understood what Judge Steele was getting at? As for Gargan, Damore paid him $15,000 for “legal and editing work” on Senatorial Privilege. Gargan eventually ended up with a hack job in Boston as chairman of a state board that essentially returned licenses to convicted drunk drivers. Ironically, despite his intimate knowledge of what happened at Chappaquiddick, Gargan became the leading proponent on the board for allowing convicted drunkards back on the road. When Republicans regained control of state government in 1991, Gargan was summarily fired. Gargan died in Virginia at age 87 in December 2017. By then he was such a forgotten figure that when his paid death notice appeared in the Globe, no Boston reporters even noticed it for three weeks. In a strange way, Damore’s life turned out like Mary Jo’s—Senatorial Privilege, now retitled as Chappaquiddick: Power, Privilege, and the Ted Kennedy Cover-Up is an unforgettable book, muckraking in the best sense of the word. But for Damore personally, it was the wrong book at the wrong time about the wrong people, and it cost him his life. But at least we still have his book—and the truth.